Hello there. 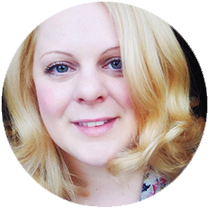 I'm Emma Jones, a hugely passionate (now ex) boudoir photographer, lingerie addict and admirer of all things antique. I'm partner to a wonderful, supportive man and daughter to the worlds most amazing mum and dad who helped make my fantastic job possible. I was self-employed as a professional photographer since 2003 and specialised in boudoir from 2007 until 2017. I'd like to introduce Danielle, she has been my right arm woman in charge of all things none photographic since 2008! She is a highly skilled stylist who specialises in fashion, makeover, bridal and boudoir (of course) hair and make-up. She is amazing and since 2008 we have styled and photographed our way around the world with clients coming from Ireland, France, America and even as far as Thailand solely for our fab duo service. She has been a huge pleasure to work with all these years and is a good friend! I will miss our mad banter and think fondly back on our 8 years together and how she helped be my co-therepist in our most challenging photo shoots! You can keep up to date with Danielle via her website and facebook "The Dan"
After leaving school in June 1999 I furthered my education at Tameside Technical college from September 1999 - June 2003 undertaking art & design, fashion, graphics, 3D and photography. I went on to study HND Photography and qualified in 2003. With very few jobs around for photographers and constantly being turned down for assistant AKA 'brew up' roles I decided to become self-employed and start taking photos. I undertook model portfolios, actors headshots, lifestyle portraits, wedding photography (freelance 2nd shooter for Northern Photographic/Unique Weddings), product shots and music photography. I did a lot of location photography in the beginning but longed for a studio environment so in 2006 I converted my home garage into a studio which I outgrew in 6 months when I realised boudoir photography was the are area of photography for me. I wanted to build specific and unique sets for this new adventure so a larger space was needed. Longing to follow my dream I took the plunge and with the help of my family and close friends I launched my first ever vintage boudoir photography studio in March 2007, one of the UK's first vintage styled studios, if not THE first! I happily photographed hundreds of women in there until one day in 2009 I decided it was time to have a refresh and do it all again, just bigger and better!! So that is exactly what I did and by May 2011 (2 years of hard work later), Copley Studio which is based in Stalybridge was ready and opened the doors for it's first clients. Hidden away inside the Grade II listed Mill is my fabulous, custom boudoir photography studio. As one of the few remaining working mills, I choose to make the most of these beautiful old walls steeped in history that provide the perfect atmosphere and environment for such vintage inspired studios. Designed and renovated by myself and my family, the studio is everything I dreamed and more. It's my own private luxury parlour where I comfortably offered women the opportunity to be photographed in personally designed, constructed and themed sets that are not attainable in the average home boudoir photo shoot. March 2017, it's my 10 year anniversary of boudoir photography, over a 1000 clients later and yes I have sadly decided to hang up my camera for a while and take a much needed break from photography in general. A lot of my clients, fellow photographers and industry people are shocked at my decision and I keep being asked the obvious question "why are you quitting?!!" Well, it's not for one reason only, there are many and I'm sure a lot of fellow photographers can relate to the below in some shape or form. For the past 14 years I have ate, slept and breathed photography and yes I have loved every moment but at the same time it has been seriously hard going. This is a very creative job, it's a specialist job, you need to be a people person, a therapist sometimes, strong, focused and source inhumane amounts of energy from the unknown. It's not simply pushing a button like many think, there is so much involved that I can't even write it all down. Any true (unfamous) professional will agree with me that their life is spent 10% taking photos and the rest is split between being slumped and exhausted at a computer, emails, updating social media, finding coffee, solving problems and then grabbing the fast food menu. Basically it is tough and sometimes too tough to have a meaningful life outside of it, I am at that point. As most people with a website and any online content will have experienced, trying to stop other 'professionals' stealing your stuff and then dealing with those who have is soul destroying! It takes up so much time having to send take down request and basically fighting for my copyright when all I want to do is photograph and help people through my work. Having most things I've created like photos, my website and it's text content, even my boudoir sets stolen or blatantly ripped off means I no longer enjoy putting my all into creating because I know someone else will take it from me. It is the age we live in. It's a very costly career choice, especially when, as I have done, bought and provided the very best I can in every aspect of my service and run my business with the goal of helping people with my photography rather than purely making money. I am 90% artist and 10% business person, the other way around I may still be photographing but maybe not. Groupon is doing a damn good job of obliterating quality boudoir photography services and pushing the cost of photo shoots down. Obviously the result of this is rushed, poor quality photos and budget services that further damage the confidence of those people who need help the most. I decided long ago that I'd rather give up photography than offer Groupon's going rate of £9 a photo shoot and be forced to take the route of 'quantity over quality' along with the hard sell to make end meet. Just no. I cover this topic in a detailed facebook post I made back in 2015, interestingly it has a lot of input from other photographers going through the same problems. I am keeping my studios for the time being and converting part of one into a workshop for the design and production of custom scenery for table top games like Dungeons & Dragons, Warhammer etc. I may create some bespoke home and wedding accessories too, place names, engraved glasses, cake stands, letters, signs, decorative boxes and more. I'm totally excited for this new chapter and to discover if it's something I can make work. In the future I would like to return to photography possibly part-time alongside my new venture. Maybe the industry will have taken a new and positive direction by then, maybe Groupon has died and people will have realised the worth of paying for excellent photography, just maybe using snap chat filters to turn yourself into a plastic-cat-doll-flower will have lost it's odd appeal and real human features will be cool again?! Regardless, keeping the studios gives me this option of return.